For a visiting yachtsman, the biggest attraction of Puerto Consuelo is that it is a relatively safe anchorage; and it is only when the boat is safely moored that we can disembark and take a look at the place we’ve sailed so far to see. 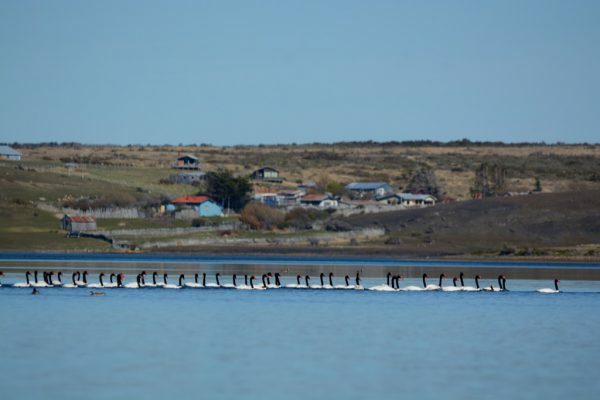 The holding at Consuelo is almost as bad as it is off Puerto Natales or at Laforest, but at least here, if you drag, you just end up on the shoal, astern. However hard it blows there are never any big waves, so you won’t pound; and provided you don’t do it on the top of the tide you’ll float off again within a few hours. Our 50kg (110lb) Bruce seldom lets go of the seabed – in fact, I can’t recall it ever having done so – but here the bed is a porridge consisting of fine sand mixed with swan excrement. 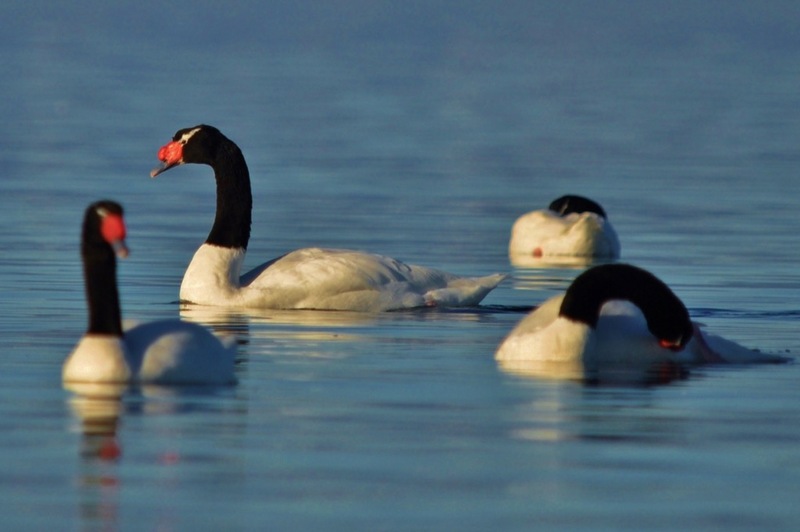 There are often a couple of hundred swans in the bay, and so far as we can see the sole purpose of their existence is to pluck the weed which grows in the shallow water and turn it into fertiliser for the next crop of weed. Their turds lie thick on the seabed. The water here is only 3m deep (10ft) but we’ve found that in order to hold station in the prevailing gale we need to use 70m (230ft) of half-inch chain. At the business end, we employ the Bruce in tandem with a big Danforth. With Bruce and Danny and that weight of chain we stay put – but we wouldn’t want to leave the boat unattended in this situation. Not in a gale. 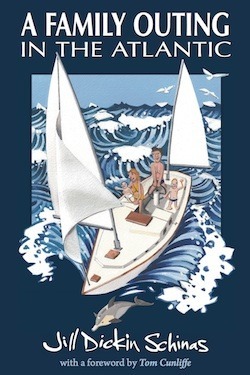 And, indeed, when it’s blowing a gale it’s more or less impossible to get ashore anyway as the waves and the williwaws might flip the dinghy. An average day at Consuelo. The other boats are local ones and they are on permanent moorings. For excursions ashore en famille we await the calm day between two weather systems. The hillsides around Consuelo offer endless opportunities for rambling, with the chance to spot hare, rabbits, armadillos, two kinds of fox, and a wide variety of birds including eagles, condors, and harriers. Aside from these local attractions there are four obvious excursions to be undertaken. First, there’s the trip to town to buy food. 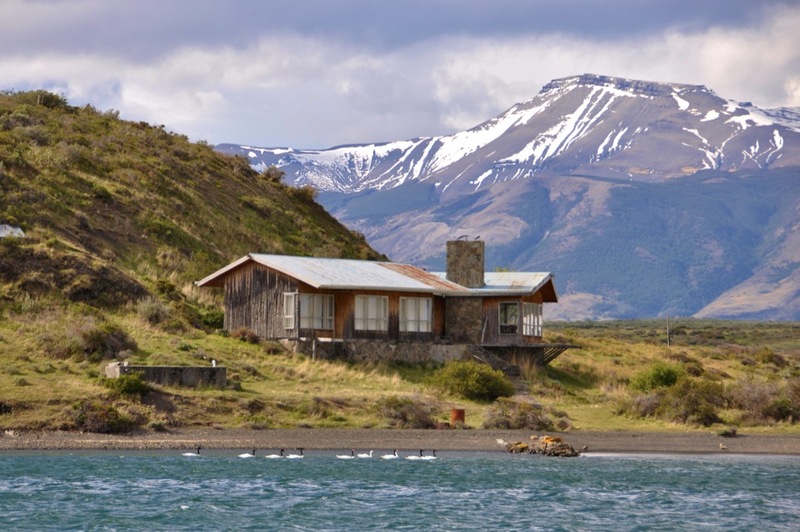 Natales is ten miles away down a bumpy unmade road – so this requires either a bicycle or a taxi. 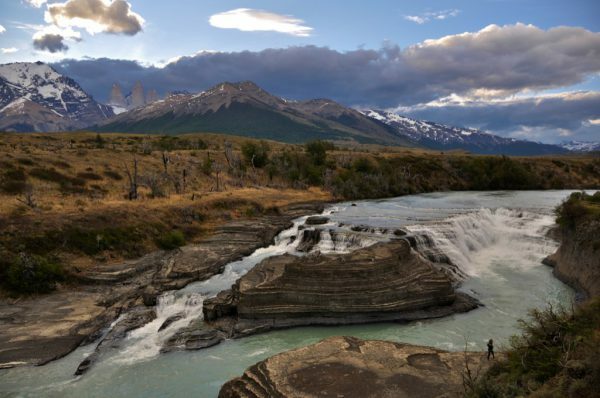 Aside from these mundane excursions, with the boat safely moored the yachtsman also has the opportunity to do some proper sight-seeing, and heading the list of ‘must-sees’ in this part of the world is the famous Torres del Paine National Park. The entrance to Torres del Paine lies some 50km (30 miles) from Consuelo and the far side is a further 50km – so this is not somewhere that you’re going to walk to. Nor would hitching be an option because there’s very little traffic on the roads. We were taken there by some friends. At the heart of the park is a spectacular mountain formed of a series of jagged spikes, and the mountain is surrounded by lakes and rivers. There are some impressive waterfalls, and at the head of the biggest lake there’s an enormous glacier – albeit, you can only reach the glacier by either hiking for a day or taking a trip on a ‘pleasure boat’. The ‘centrepiece’ in the Torres del Paine National Park is a huge lake at the foot of a vast glacier. Lago Grey, with an iceberg considerably taller than Mollymawk‘s mast. The mountains in the distance are the torres for which the park is named. Waterfall on the northern border of the park, with the torres in the background. 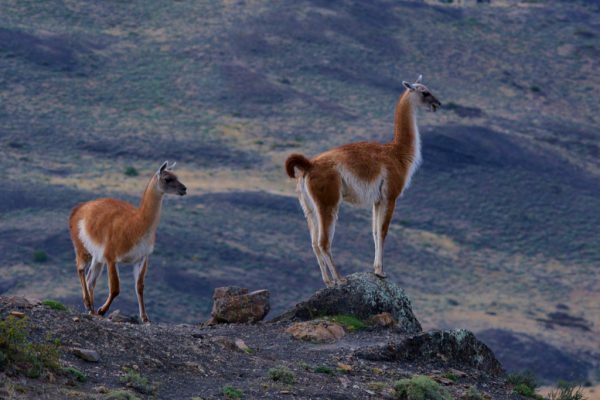 There are also lots of guanaco to be seen, and there are said to be puma. The alpha-male guanaco in classic pose. Besides enabling the animal to keep an eye out for pumas, this elevated position and his neat and tidy stance are also is designed to impress the ladies. 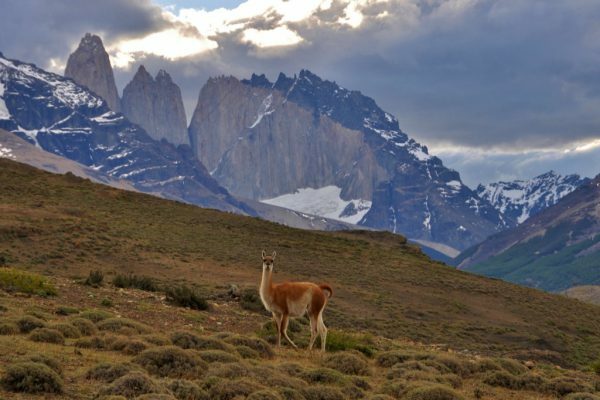 The Rough Guide to Chile calls Torres del Paine “one of the world’s most stunning geographical features”. 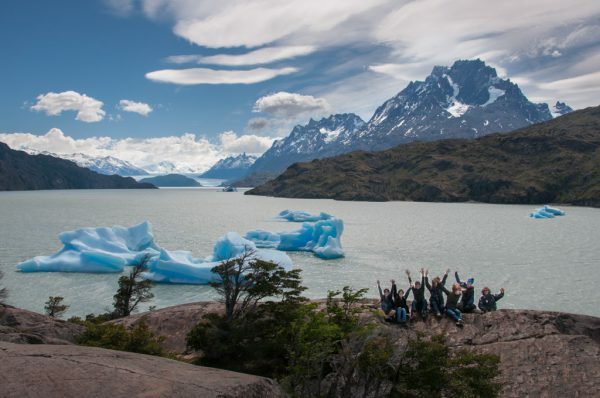 By contrast, it has been suggested that anyone who has passed along the Beagle Channel and who has dodged amongst bergy-bits and clambered up boggy mountainsides to glacial lakes has seen equally impressive sights. At the centre of Torres del Paine there is an estancia; and the place is well served by roads; and there’s a hotel looking out across the great Grey Lake; and there are campsites and refugios beside the well-trodden paths. 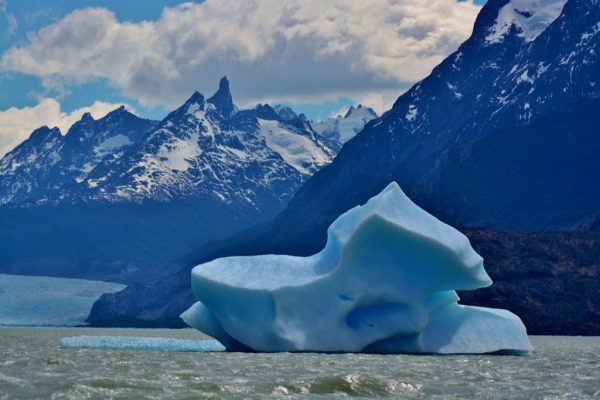 Travelling through the wilderness of Tierra del Fuego under sail we have the glaciers and the peaks all to ourselves, and, for the time being at any rate, they are still pristine. Regardless of this fact, I do feel that a visit to the park is very worthwhile, and I’m sure that anyone who has the time and money to spend three days walking amongst the ‘towers’ would enjoy it immensely. For those who decide to go there, I recommend taking the road which skirts the south side of the park and leads to the further side, and so beginning the tour at that end. This road takes one through a spectacular landscape of broad valleys and crumbling hills – a drive-in geological exhibition. That brings us to the fourth expedition – and this is the one that we enjoyed the most. 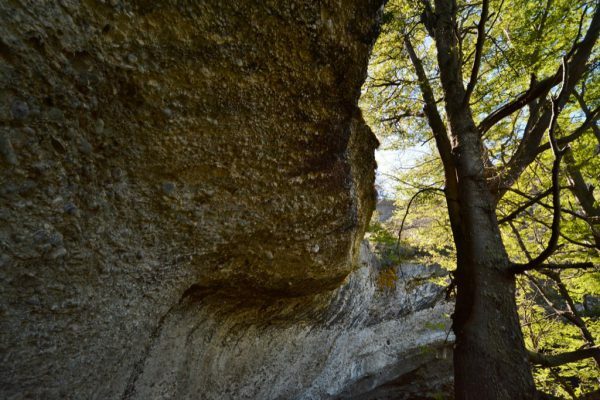 Just five and a half miles (9kms) from Consuelo stands the cave where Bruce Chatwin’s grandmother’s cousin found the brontosaurus. Bruce Chatwin’s grandmother lived in Sheffield in a red brick house guarded by yellow-flowered laurels and red roses. Inside, various artefacts fascinated the little boy: There were fine oil paintings and porcelain animals; there was an articulated monkey; but the most exciting thing of all was the little piece of brontosaurus. – and it was that piece of hairy red skin which the old lady kept in a glass-fronted cupboard in her dining room. My father-in-law has a glass-fronted cabinet in his dining room, and in that cabinet, amongst other things, are a small piece of a tram which was blasted to pieces during the Blitz, and the bullet which killed a 19th century family ancestor called Og – but Chatwin’s piece of brontosaurus skin surpasses both of those. Except that it wasn’t a piece of brontosaurus skin. Bruce did not discover the true identity of the owner of the reddish brown hairy skin until he was an adult travelling in Patagonia. Here, in the course of his attempts to trace Charley, he was directed to go to Puerto Consuelo. It was dark when he arrived but he could see swans floating near the shore. He found “a big German house, but the windows were shuttered and the door barred”. 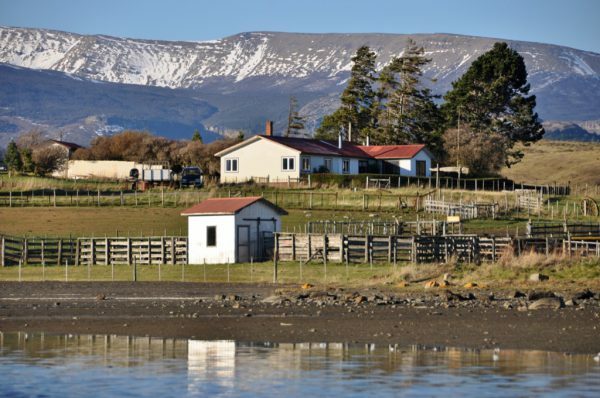 It sounds as if he may have been banging on the doors of the sheep-shearing shed, which is the only big building and the only one close to the water. The true story of the brontosaurus which wasn’t a brontosaurus is actually even better than Chatwin’s tale. Some two years after having arrived at the place which he named Consuelo, Herman Eberhard decided to explore some caves which happened to be on his new property. 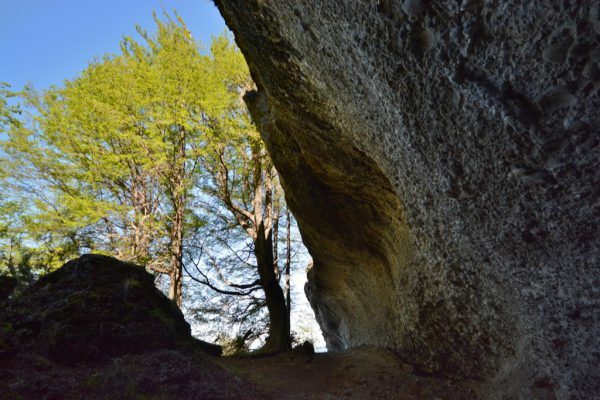 The bigger of the caves is visible from his house and is so inviting that, had it been me, I would have strolled over there within the first week of my arrival – but I guess Eberhard was busy setting up his ranch. 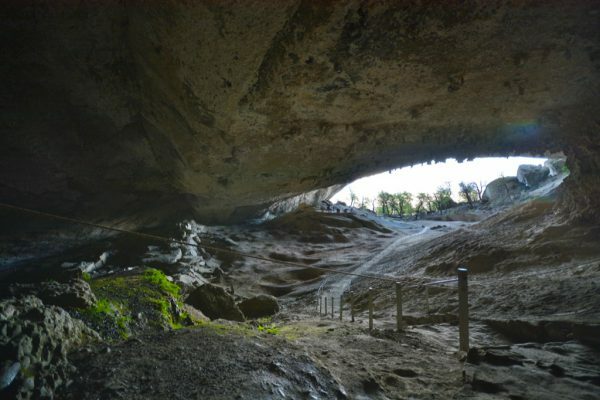 There are actually three caves – one with a small mouth; one slightly larger; and one with a gape which, as I say, is visible from five miles away. They are said to have been formed immediately after the last ice-age when the melting glaciers formed a big lake. The hill into which they are notched was a cliff on the edge of the lake. In the big cave Eberhardt and his friends found a human skull and a strip of skin which was protruding from the ground. They dug it up, and found that the skin measured four feet by two (120cm x 60cm). Eberhard took it home and hung it in a tree so that the rain might wash it. One month later the La Plata museum published a sensational report: First Note on Mylodon Listai – a LIVING Representative of the Ancient Gravigrades of Argentina. Seemingly, nobody but Bruce Chatwin’s grandmother ever thought that the red-haired skin belonged to a brontosaurus. 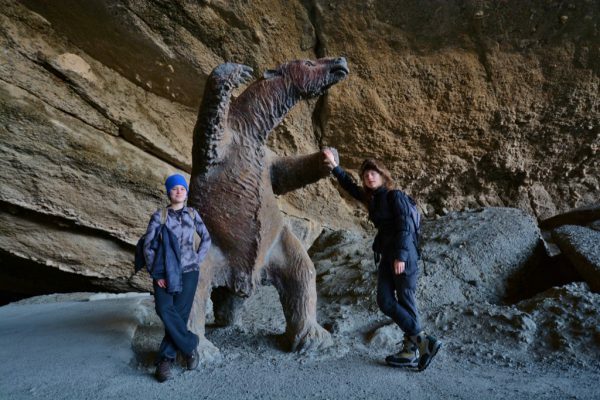 One of Eberhard’s friends had reckoned that it came from a cow, and he himself had thought that it was possibly from a sea-mammal which got stranded here when the lake shrank; but the palaeontologists seem always to have known that it came from a giant ground sloth, or mylodon. I guess it was the claw which clinched the matter. Many other milodon skeletons had been found over the years – Darwin found one on a beach in Bahia Blanca (Argentina), and that ossuary in La Plata already owned several – so it was an easy thing to match the pieces. What made this find so very different and so special was the skin. In fact, when they had another look in the cave, the archaeologists also found a layer of sloth poo. Perhaps the fence is to keep us from walking in the sloth poo? They had turds, and they had a skin so “remarkably fresh”, as the British Museum’s chief palaeontologist put it – with the blood clots so red – that, were it not for the fact that the beast was supposed to have been extinct for thousands of years, he “would have no hesitation in pronouncing the animal recently killed”. And this, from a man who had handled the remains from a deep-frozen mammoth. Seemingly, the two just didn’t compare. A few years previously, the president of Argentina had shot (and missed) what was described as “a huge animal resembling a giant pangolin”, and the excited curator of the La Plata museum saw in this event a further proof for the unsuspected continuing existence of the mylodon. Funds were raised and the hunt for a flesh-and-blood specimen began. Thus far, it has not turned up its objective. The mylodon is – or was – a herbivore (this much has been established from an examination of the turds) and it is believed to have fed by standing on its hind legs and pulling down the branches of trees. Thus it occupied a niche and was not in competition with prehistoric horses and other grazing animals. 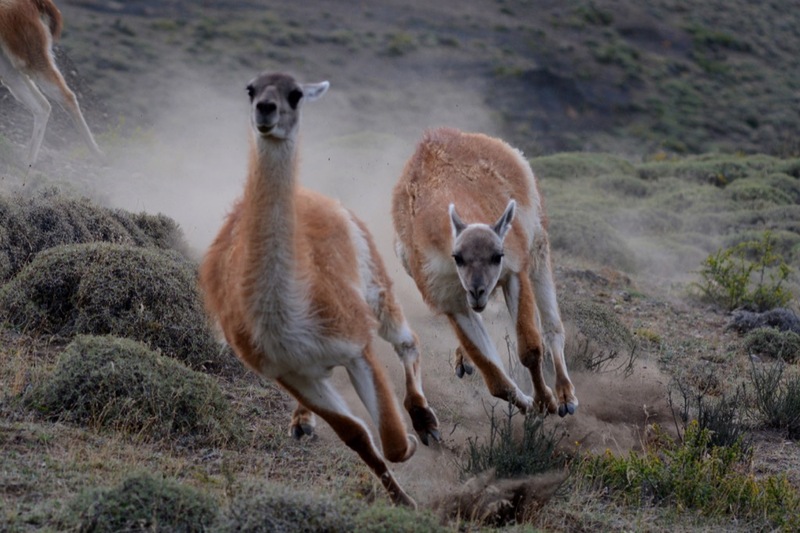 Besides having a tough hairy hide its skin was also covered in little boney platelets – something to bear in mind if you should happen to meet one on some remote Patagonian island and feel inclined to have a go at bringing it in. How could a skin survive for millennia? And how could those turds have lain undisturbed all down the ages? To any but the bone-specialists the suggestion that this animal was extinct seemed ludicrous – but the experts eventually quashed any further hope of sightings by radio-carbon dating the Eberhard remains to 8,000 BC. Coincidentally (or not) it was about 10,000 years ago that man arrived in this neighbourhood. So perhaps those huge claws and that armoured hide were not enough, after all, to save the beast from our cunning ways. 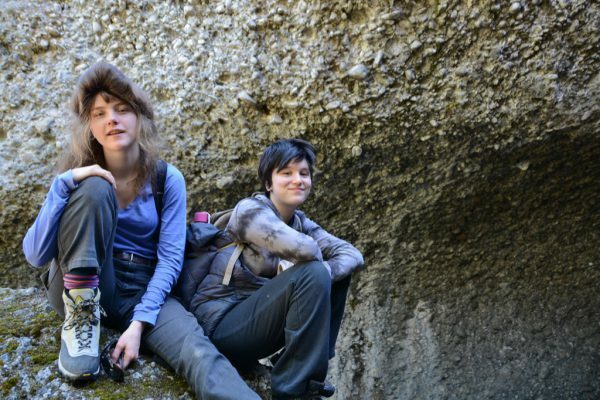 As for Chatwin’s grandmother’s cousin – Charley was one of a small gang who went to the cave, after the archaeologists had left, and blasted the floor apart. He subsequently made off with yards of skin and piles of bones and claws which he sold to the British Museum for £400. And at that time, £400 would buy a house in London or a mansion in Punta Arenas. Hence, Señor Eberhard’s greeting when Bruce rocked up on his doorstep. 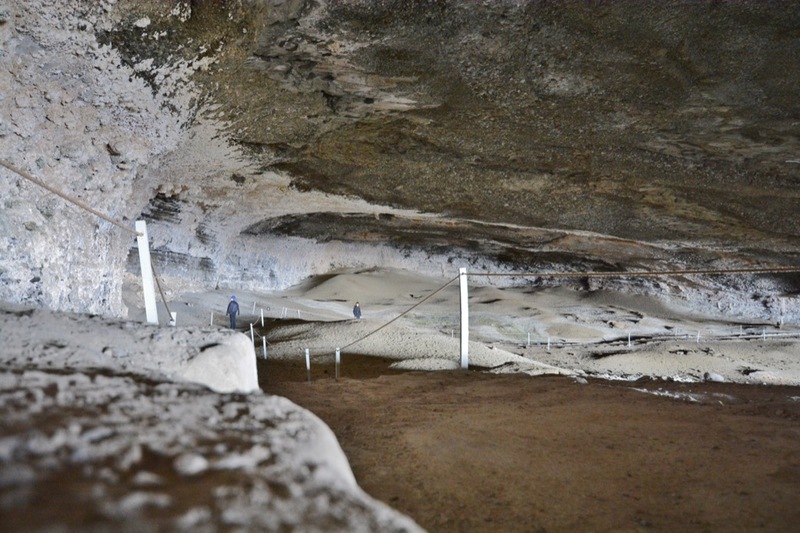 The Eberhard family eventually sold the Cueva Milodon to a man who saw its potential as a tourist destination. So, you now have to pay to have a look inside. 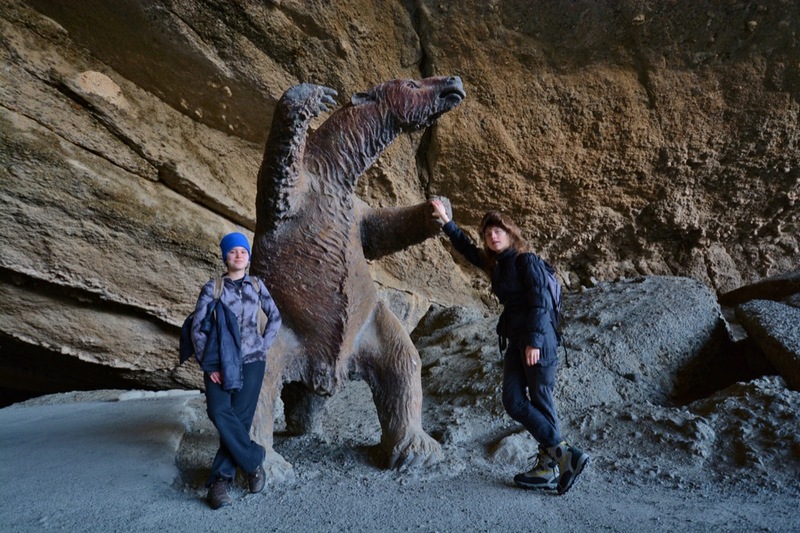 In the entrance there’s a model of the giant sloth standing on its back legs, and looking impressively large. It’s a little disappointing to think that the only sloths to be seen here nowadays are imaginary ones, but if you’re very quiet – and very lucky – you just might see a puma. Eberhard’s groom told us that there are lots around. Our visits to Consuelo were all made during summer. We have been told that in the winter the place is a lot less windy; however, we’ve also been told that in a cold year the bay ices over and is unusable. The Eberhard creek is very shallow in patches. Mollymawk draws 2.2m and at times during our approach we had only 10cm under the keel. The first place which one reaches on entering this arm of the estero is Puerto Condor. Anchorage is possible here, but there’s nothing ashore. The next place is Puerto Prat. Here there are a few houses. We have anchored on the shore opposite Prat, close to what seemed to be a holiday home. 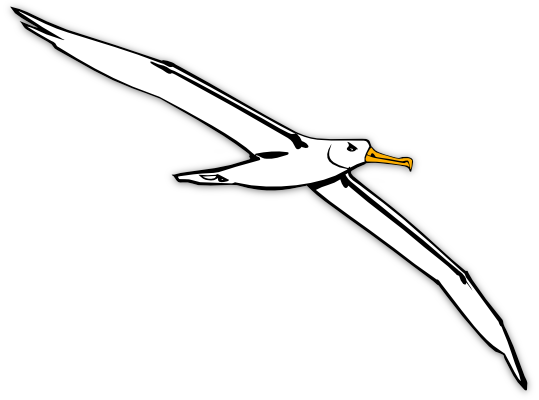 Consuelo is just upstream from Prat but between the two settlements lies an island – Isla Kruger. We’ve been told that this place was named for one of Eberhard’s two companions. We’ve also been told that the early colonists are buried here; so, putting two and two together, I would guess that Herr Kruger was laid to rest here. 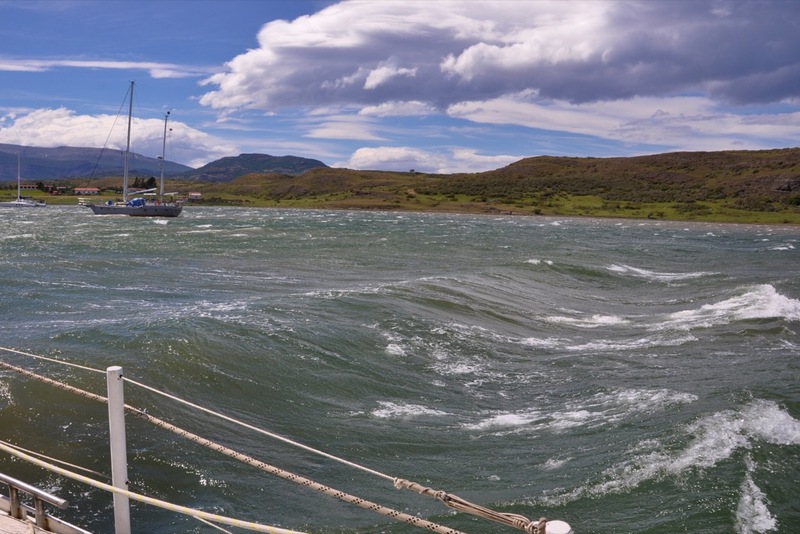 Although it might seem tempting to take the broad expanse of water which lies to the east of the island, and thereby avoid the narrow, windswept Angostura Diablo, we don’t recommend it. We’ve seen a Bavaria come through here successfully, but on his way back down the channel the skipper took the same route and grounded twice, spending some time sitting on his keel. Avoid anchoring in the mouth of the ravine, which continues on past the settlement of Puerto Consuelo. This is the windiest patch of all. Likewise, steer clear of the eastern half of the bay as it’s very shallow. Bear in mind when you go ashore that this land is all privately owned with no right of thoroughfare. The Eberhards seem to be of a retiring nature; intruders in their domain are neither welcomed nor confronted, and it therefore behoves us to track them down and formally request permission to be here and to stomp to and fro along their drive. 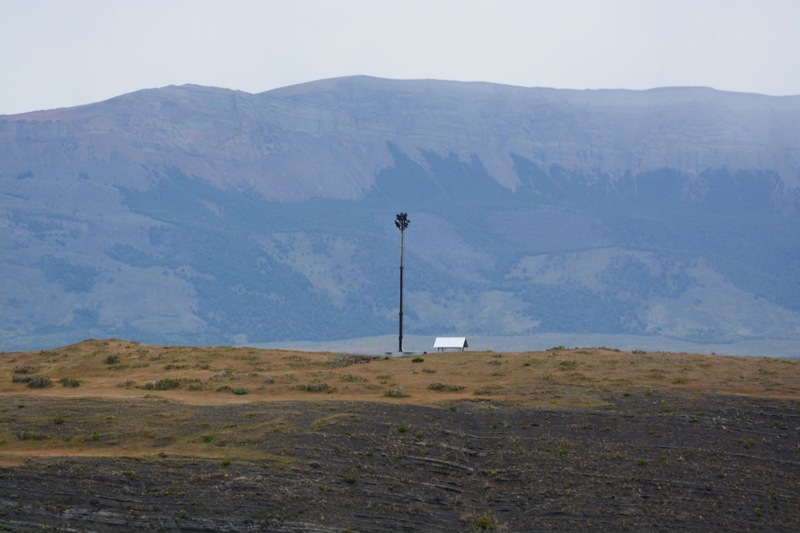 At the time of writing a phone company is installing a cell-phone mast on the hill overlooking Consuelo. They’re trying to disguise it as a tree. 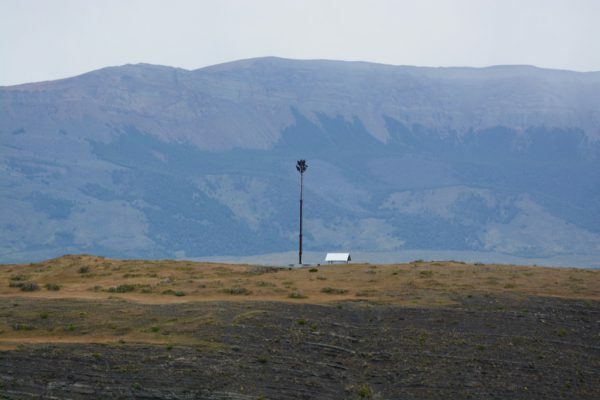 In the meantime, there is cell-phone coverage from the top of this hill or from the hills on the west side of the bay – so you can check your e-mails in the company of hares and armadillos. The only problem is getting ashore to get at them when the gale is blowing. this blog is pure gold, I’m following it from the beginning! Thanks, glad you enjoy the site! All sorted with the hack now, fortunately. 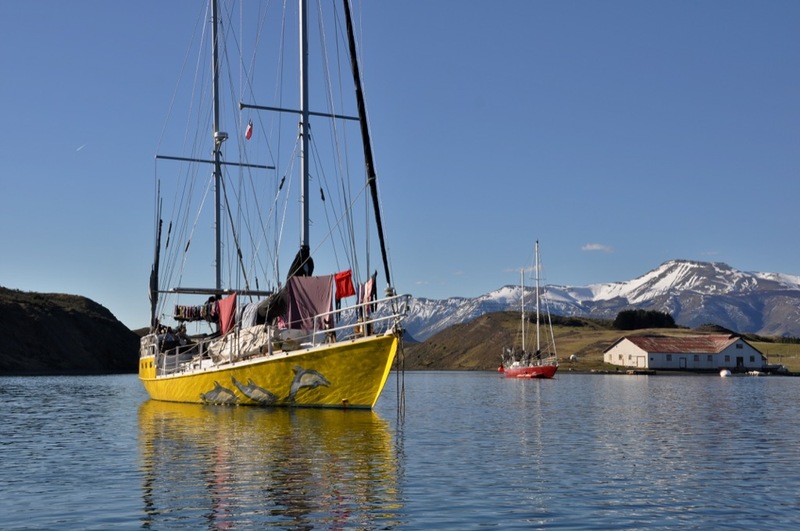 Wonderful post about cruising, the challenges of going ashore, and your adventures on shore. Made this reader want to go to Punta Arenas, cueva Huemules, and Torres del Paine (but I think I’ll fly – thanks). Thank you!